Most of the time with parties, you get a do-over. If Halloween falls a little flat this year, there’s always next year. Even birthday parties don’t always get our full attention. We are in the middle of life and school and flu season and sometimes cupcakes have to work. But then there are the times you only get one shot. One chance to make it the way you really wanted it. A sweet sixteen. A long-awaited baby shower. An engagement party. A graduation. If you are a laid-back sort of person who likes to throw potlucks for this type of party, this post probably isn’t for you. I would probably not be described as laid-back, especially in the party planning arena. Oops. Did I say arena? Sometimes I feel a battle is being waged. My time, budget, hopes and dreams for as much as I can possibly accomplish. It can all get overwhelming really quickly. Where to start? First, set the framework. Just the beginning basics of your party. These can be tweaked later. That would be the date, day and time. Are you having a pool party on a Saturday afternoon or an outdoor engagement dinner under the stars? The time and day of the week do make a difference. Now make a little sketch of the location. If you are outside, take note of the location of the trees and deck and driveway. Will you have room for a long table or several smaller tables? Measure if you need to. Where will the guests arrive? Will you do a small decoration or table there? Will there be gifts? Where will they go? You get the idea. Just think through your path as a guest and note which areas will need tables, chairs, decorations, food, etc. Now is the fun, fun part! Pre-shopping! First make a Pinterest board and look for ideas. These are not ideas you must copy. After pinning a few dozen ideas, you will see a theme in what you are pinning. Maybe you like a certain color combination. Maybe you pinned 12 cupcake recipes. Chances are there is something in common. Holding that theme loosely in your mind, now pick up to six places to shop. 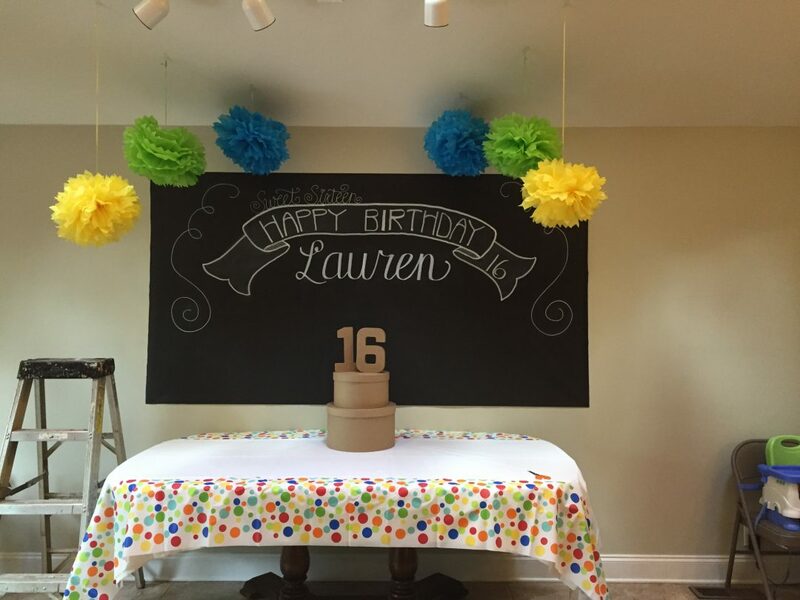 For my last party, I picked Target, Hobby Lobby, AC Moore, Party City, Etsy and Amazon. You don’t need six, especially if time is limited. Two or three shops will work nicely. You really need a smart phone for this next part. If you don’t have one, it is worth borrowing one or a helper with a phone for this activity. Literally walk the aisles of the store and take pictures of items you might use or like for the party. It can be an ice bucket, crepe paper, an art piece, dinnerware, a gift, anything! If possible, get the price in the picture. Don’t even take a cart around with you. Keep moving. I do two stores the first day and two more stores the next day. The online ones like Etsy can be done in the evening or whenever I have time. Once you have done a thorough looking for what items are available to you, you are ready to commit. Number 3 – Commit and purchase. Look through your photos and decide what items are your favorites. Which ones you will use for your party. You do not need to go with all new items! If you love parties, chances are you have lots of dinnerware and serving pieces. This would be a great time to pull out what you already have and then choose what new pieces to purchase. I actually put serving pieces on my table and keep rearranging until I am happy with my choices. If I am missing items that I need to purchase, I make my list and do my shopping all on one day, if possible. You should have a good idea of the cost and location of all of the items you want. Ok. So far, we came up with a framework of ideas, we pre-shopped and now we have purchased our party items. We also set up the actual arrangements of our items and took pictures. Doing good! Last but not least. Managing your timeline. Let’s talk lists and food and day-of prep. Lists are critical. I would make a list of each area. For instance, for a baby shower, I would make a list for entryway decorations, a gift table, food table, seating and games. Under entryway decorations, list everything you need to bring as a reminder. If the party is at your house, that is a bonus! You will probably have some of these miscellaneous items. But if you are planning the party outside at the lake or your friend’s condo, don’t assume there will be scissors or packing tape. Try to think of things you might not have and add those to the list. If you have a sign to hang, how will you hang it? Do you need tape or command strips, etc. Under seating, count how many chairs you have and if you will borrow them and from whom. Go ahead and talk to those people and get permission and make plans for when you will pick them up. Write those details right on the list. Make each a separate item so you can mark them off as you pick them up. If you are having a drop-in, then you just need extra seating, not one per guest. Under the food table list, write out your complete menu. If guests are bringing food, write their names next to the item they will bring. Confirm with them the week of the party. If food is being picked up, write the name of the shop and the time of pick-up on the list. If you are making all the food yourself, then simply write a timeline. Write the day of the week you will make that item. If the look of the table is important to you, plan which serving pieces to use for each menu item. If you are planning to use your own dishes, glassware or flatware, now is the time to confirm how many pieces you have. Also check your TP and candle stash. Anything you already have from shopping gets a check mark. As you confirm with helpers, give those items check marks as well. Depending on the logistics of your party, you may need to line up some helpers. If you are having an outdoor dinner or are renting lots of large items, make sure you have strong helpers and that it is set up as soon as possible. You don’t want to be sweating and moving furniture 30 minutes before your guests arrive. For an outdoor party on a Saturday, I would try to be set up by lunchtime. Then you have all afternoon to decorate or finish the food. You will still need help getting all the plates out on time without bugs. Strategize parts that will make your life easier. Caterers use strong buckets to store plates and glassware. Maybe you could store your plates outside like that, covered until needed. Or serve your dinner, buffet style. If you tend to go overboard, pick one really special element and stick with it. For my daughter’s 16th birthday, I wanted an outdoor movie and an old typewriter for guests to type their messages to her. I did both of those things, but the typewriter is the one she remembers. For a family engagement party, we did an outdoor dinner and my brave brother strung white lights in our old oak trees and it was magical. Really, really hard. But magical. I know that was a whole lot of words and no pretty pictures! Don’t worry. I am posting details of how I used this method to plan my daughter’s high school graduation party. And in time, I will post about her sweet 16 as well. And I promise to show you lots and lots of photos for those! Try it out. Set up arrangements and take pictures.